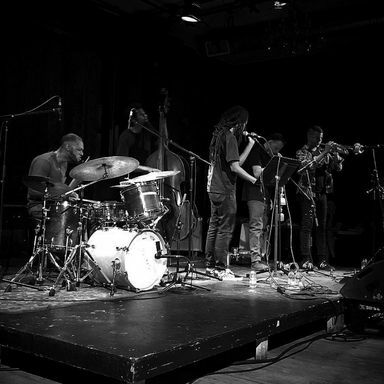 Irreversible Entanglements is a Philadelphia free-jazz poetry band that came together in 2015 to perform at a Musicians Against Police Brutality concert. Now an internationally touring phenomenon, their blend of liberation sounds and direct, visceral lyrics breathes new life into the legacy of the fusion of poetry and Black music. The dynamic band of exciting, experimental artists (Keir Neuringer - alto saxophone, Aquiles Navarro - trumpet, Luke Stewart - double bass, Tcheser Holmes - drums) skillfully reacts to poet Camae Ayewa’s (a.k.a. Moor Mother) powerful lyricism.